The winners have been announced; some are worthy, some are questionable. I’d like to take this opportunity to bestow my own awards, which I can almost guarantee will not be appearing in anyone’s PR kit in the near future. Best source of caffeine: Bold Street Coffee. Founder/Owner/Coffee Fanatic Sam Tawil has brought independent, quality coffee back to Bold Street after the closure of Coffee Union last year. He also runs the mobile coffee company Transition Espresso, which you can visit at farmers markets and events around the city. Their coffee has flavours you won’t find anywhere else in the city; witthout a doubt it’s the best I’ve tasted in Liverpool. Not a coffee drinker? Then get to Brew. Though these two appear rather different on the surface, I think their aims are the same: great drinks in an interesting space. Santa Chupitos feels like the hole-in-the-wall cocktail bar you might find in New York; Shipping Forecast gets the students in with a fine range of beers and food and its venue space. Both are standouts on Slater Street. Occupying a former Mexican restaurant, Clove Hitch has kept its decor simple and its menu straightforward. The evening menu offers well-prepared standards (I couldn’t fault my mushroom risotto) and the daytime one has a variety of sandwiches and platters for all tastes. A good selection of vegetarian options too. A few beers on draught wouldn’t go amiss, but I will gladly miss out the taps if it means they keep the increasingly elusive Kopparberg Elderflower and Lime cider in stock. I don’t eat at Delifonseca often enough. But now that they’ve opened their second branch near Brunswick Dock, that might change. I used to live within staggering distance of their new location in the former Il Bacino, but now I’m only a short drive away, and don’t have to worry about where to park. We visited last Thursday and thoroughly enjoyed our meal. The beer list offered an Scottish brew from Innis and Gunn, aged in bourbon casks over 77 days. This maturation give it an unusual whisky flavour, and a bit of a kick at 6.6% ABV (laugh away, I admit I’m a total lightweight). We shared a chicken liver pate to start, then the herby fishcakes for me and the bangers and colcannon mash for him. When I asked for mayonnaise with my chips, a waiter emerged from the kitchen to apologise that it wasn’t available and offer some garlic aioli instead. Now that is the kind of substitution I like to see. The fishcakes were excellent and husband’s colcannon mash was mouthwateringly creamy. We were too full for dessert, but did have a stroll through the foodhall. It has an expanded selection of the ranges available in Delifonseca Stanley Street, and the addition of Brough’s Butchers. 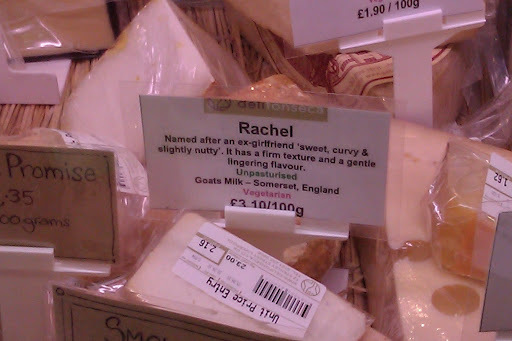 Really though, it was the cheese counter and the discovery of my namesake cheese that has sealed my love and loyalty. Correction: Both bars are on Slater, not Seel, Street. Sometimes you wouldn’t know I’d lived here five years. After coming home full of appreciation for another delicious (and sunny) food festival launch day, we decided we wanted to try a new restaurant on Monday and take advantage of the 50% off promotions available. Having enjoyed a meal at The Monro on Duke Street awhile back, we decided to try its sister restaurant, The James Monro, on Tithebarn Street. Its offer was, and I quote, ‘half price off rump steaks’ (click on the link then The James Monro to see its Monday offer). I mentioned this offer to the man taking my reservation, who was extremely friendly and professional, confirming that was the offer. Sadly our experience didn’t live up to our anticipation. The James Monro has been decorated in a neoclassical style befitting its early 19th century namesakes (both a ship running the first regular passenger service between Liverpool and New York and the fifth President of the United States). We arrived a few minutes early and had our choice of seats; unfortunately, we picked the Invisible Table ™. You know, the table which has the only unlit candle, unnoticed by waitstaff out of at least twenty candles burning throughout the restaurant (I eventually lit it myself because I like playing with matches). The table that has no cutlery even after the starter arrives (we ate the salad leaves accompanying our garlic bread with our fingers because we’re classy like that and hate waste). The table which just seems to be overlooked by waitstaff serving every other table around it. So our restaurant karma was a little off from the beginning. The James Monro’s website mentioned a new menu available from September; I can only surmise they’re still getting the hang of it. There were several typos (it took us a little while to figure out what a ‘wind mushroom’ was) and some incongruities with dishes available on the early bird menu vs the a la carte menu and vice versa. The goat’s cheese and courgette parcel with asparagus and yoghurt and mint dressing I ordered wasn’t available, I was later informed. And when my husband went to order his steak, he was told that yes, it was available as part of a 2-for-1 offer. The waiter noticed that we were just *slightly* taken aback, because 2-for-1 was not quite the same thing as half price. If it was, we wouldn’t have come, because I don’t eat steak. Husband asked for a few minutes to revise his order and the waiter retreated to the kitchen. He returned a few minutes later to say that they would be willing to do husband’s steak at half price. All credit to him for resolving the issue, but we shouldn’t have had to make a fuss to get what was stated both online and by the member of staff who took our booking. Faff aside, our food was quite good. I settled on fish and chips since the main I originally wanted wasn’t available. Husband’s steak was cooked exactly as he ordered, the peppercorn sauce looked appealing and the chips were proper big, handcut chips, cooked almost to perfection. My fish was flaky and moist, the batter dark and crispy. My chips were equally tasty. We don’t like being the couple that have to make a point to get the level of service that other tables are shown as a matter of course; I had to ask for a wine list, whereas others just got them alongside their menus. It left a slightly bitter taste, metaphorically. While the food was nearly the equal to The Monro’s, I’m not sure I’ll be heading back to the James Monro. The business district definitely needs more quality restauarants if it wants to be be more of a destination after 5pm, so I wish them the best and hope they can live up to the potential that’s there. 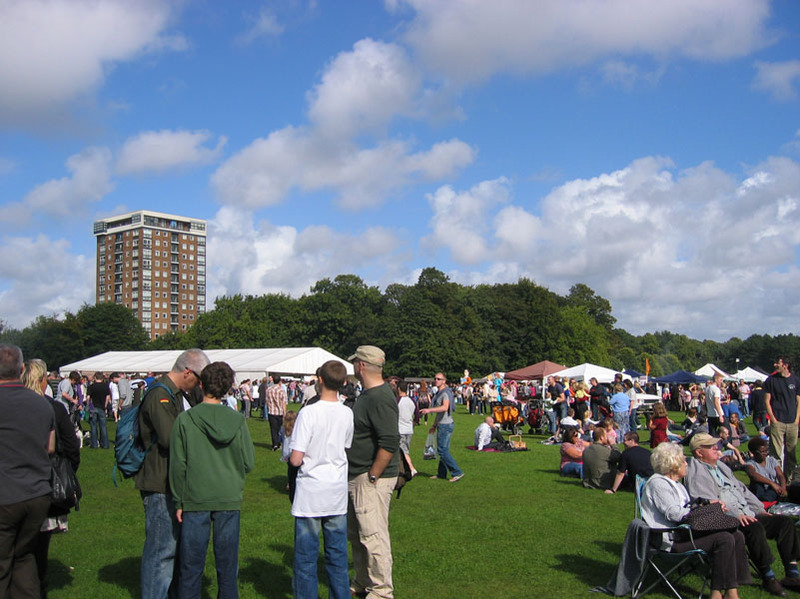 The third Liverpool Food and Drink Festival began yesterday in Sefton Park. 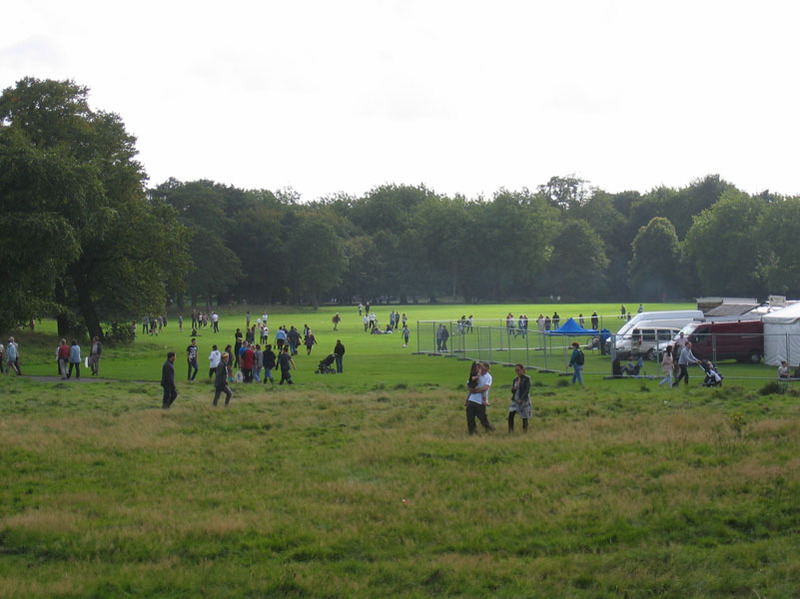 Saturday’s rain gave way to sunny skies, though the ground still had festival-worthy mud in places and wellies were out in abundance. The number of stalls had increased noticeably over last year, with more vendors traditionally found at farmers markets alongside the usual restaurant suspects. Crowds gathered around the cookery demo/celebrity chef marquee and we spotted James Martin striding through the crowd, with minders. It was good to see smaller restaurants alongside the heavy hitters and my favourite sources of caffeine on Bold Street, Brew and Bold Street Coffee, were doing a brisk trade. French Quarter Bakery had an impressive stall, twice the size of a normal Lark Lane market offering, while Liverpool Cheese Company’s seemed rather smaller than usual. After sampling as many freebies and entering all the competitions we could, it was difficult to choose where to eat properly. Husband went for some beans and rice with friend plantains to start before settling on a hog roast for mains. A friend chose the fish curry from Spice Lounge. And eventually, I settled on Chaophraya, and their mixed starter plate. Their stall was one of the best looking, and I appreciate how much effort went into its appearance as well as the food. The starter plate held chicken satay skewers, a veggie spring roll, corn fritter and strips of beef. We shared a jug of mojitos while listening to a steel drum band. Eventually we queued up to get a crepe from some French friends whose creperie appears around the city during continental markets. We made our way home in the autumn sunshine. The rest of the festival consists of Restaurant Week-style offers and events at participating venues. I hope to visit at least a couple restaurants, especially the new Delifonseca Dockside at Brunswick Dock. More to come. Over the summer, I saw ‘coming soon’ signs for a new place to eat on Smithdown Road, near Dafna’s Cheesecake Factory, that I thought might offer something a little different from the usual takeaway sandwich shop. Namely, bagels. Called ‘Bagelicious’, it promised bagels, paninis, the usual variety of coffee drinks, etc. I should have realised the sign above their door announcing said “bagel’s” was a warning to be heeded. Now, I’m probably a little luckier than most Americans who didn’t grow up in the New York metropolitan area, because I was familiar with bagels from an early age. Every Saturday after ballet lessons (which I enjoyed despite my total lack of grace or rhythm) we would go to Bageland, the bagel bakery in Murray Hill, one of Pittsburgh’s Jewish neighborhoods. Strictly takeout, there were 6, maybe 8, flavors of bagels. Plain, sesame seed, onion, poppy seed. Cinnamon raisin was the only sweetened variety available (and I’ve debated with another baking friend whether or not it counts as a ‘proper’ bagel flavour; she says no). They were fresh from the oven and exactly what a bagel should be; chewy inside with a perfectly thin, shiny crust on the outside. I don’t even feel right calling it a crust, because that implies a flaky crumbliness that it doesn’t have; it’s more like a skin, because of boiling the bagel dough briefly before baking them, which seals it. This was long before the chains of Bruegger’s and Einstein Bros came along to introduce bagels to middle America. Before flavors like asiago cheese and blueberry were sat along side the plain and the cinnamon raisin. Though Bageland is sadly long gone, I was lucky enough to live in New York for a few months after graduating and experience some gorgeous (and frankly, enormous) bagels and shmears from Ess-a-Bagel. So I admit, my standards are probably unfairly high. That said, if you’re going to make bagels a cornerstone of your brand, then for the love of cream cheese, the least you can do is sell actual bagels. Not barms/baps/sandwich buns with a hole poked in the middle. That is what we were served yesterday, with a fairly average choice of catering pack sandwich fillings available. And since they were still packaged in the wrap of the wholesale bakery from whence they came, I now know exactly which company to thank for making a product that was far less authentic and palatable than the Tesco brand bagel I had for my breakfast that morning. Cheers for making decidedly average supermarket bagels look downright appealing. Still, I can see it doing well among students who can’t be bothered to walk to Oomoo. The exposed brick walls, wooden tables and brown leather seats are attractive enough, and free wi-fi is meant to be available, though we didn’t test it out. I’m as disappointed in the lowest-common-denominator approach to food and the wasted chance to stand out and provide something not widely available in this city as much as the mis-selling of their key product. If you do bother going to Bagelicious, save yourself the letdown and skip the bagels.